The game was LOGO MOTION™. After the Kick-off, we broke into groups to look at design options. A design strategy was formed and sub teams were created, each responsible for one part of the robot. There were groups for the drive train, lifting arm and grasping mechanism, and one for the mini-robot. We named our robot “Reptar”. Our two mini-robots were “Lil” and “Phil”. The Greater Kansas City Regional could not have gone better. FIRST Team 525 was honored with the Motorola Quality Award, the robot and mini-robot worked extremely well, and we finished the qualification matches 10-0 and were seeded number 1. 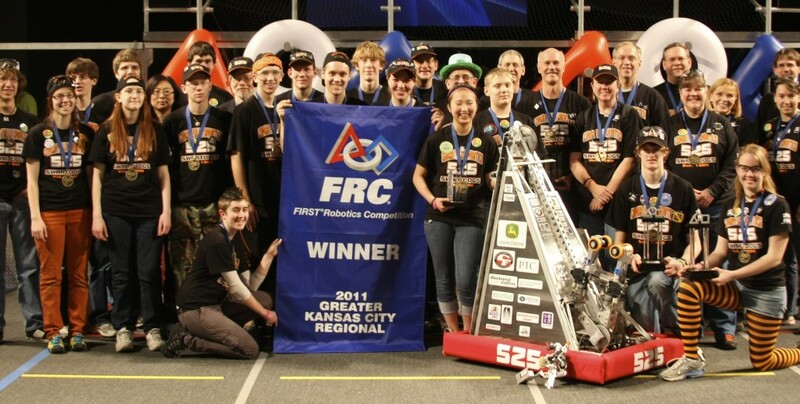 Our alliance went 2-0 in the semi-finals, 2-0 in the finals and we repeated as Greater Kansas City Regional Champions. Minneapolis 10,000 Lakes Regional also went well for our team. FIRST Team 525 was honored with many awards. We were most proud of our team leader, Mr. Kenton Swartley, receiving the Woodie Flowers Award. We finished the qualification matches undefeated and ranked number 1. In addition to the Woodie Flowers Award received the Excellence in Design Award. This recognizes a specific feature or a robot as a whole. We were also fortunate enough to receive the Quality Award for the second time this season. During matches, we successfully implemented a dual ubertube autonomous program. This year, we created a new scouting program for iPods, which was made available on our website. We teamed with Team 967 and 3642. We lost only one match for the weekend, a hard match during the semi-finals. St. Louis Championships brought new challenges. Modifications made to increase the speed of our mini-robot weren’t as successful as we had hoped. We made it to the elimination round and were defeated by a very good alliance. 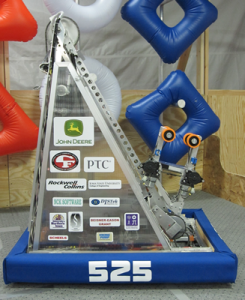 LOGO MOTION™ was the FIRST 2011 FRC game. The game consists of two three robot alliances trying to hang as many inflatable objects on a grid as possible during the match. The game is played on a 27 by 54 foot rectangular field. In the middle of the field are 4 towers. The game starts with an Autonomous Period for 15 seconds during which the robot must hang an “Ubertube” on the grid. Then the drivers take control and try to hang the pieces on the grid. They have bonus points when the pieces create the FIRST logo. The match ends with the robot deploying a “mini-bot” that climbs independently to the top of a tower. The faster the mini-bot gets to the top, the more bonus points they may score.